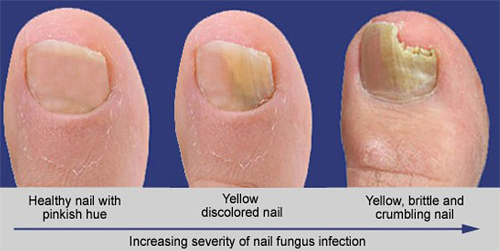 The most common cause of brittle yellowing nails is fungal infection. Millions of Canadians are infected with dermatophytes, non-dermatophytes and candida species feeding on the nail keratin. These organisms propagate in a warm, dark and moist environment. There is no better place for nail fungus to reside and infect toes than in shoes. Infected nails have yellowing to brownish, or white spots on the nails. The large toenail is usually the first to be affected. As the infection develops, nails often become thicker, further discolour, fracture, and crumble. Progressive infection of other nails occurs often, secondary bacterial infections are not uncommon, and psychosocial issues. The ability of the 1064 nm laser energy, without anaesthetic, to gently heat the nail bed, makes it ideal for safe and effective clearing of the nail bed of fungi. The photo-thermal effect changes cellular metabolism and at increased temperatures, cell components are damaged and metabolism is altered. Lipids in the cell membranes are changed in structure, compromising their function of protecting and regulating the internal environment. The outcome is fungal death and nail clearance. As is seen with the common oral anti-fungals (Terbinafine, Itraconazole and Fluconazole) the re-occurrence rate can be extremely high. Topical anti-fungal liquids may help to alter this observation. The laser can be an alternative to oral antibiotics (pills) which are taken over a course of 3 to 4 months or longer. Do I need a podiatry visit? Probably most people with fungal nail problems have tried topical and other home remedies at one time or another. Melaluca (tea tree oil) is a popular home remedy. It's reported to work in a laboratory petri dish, but there is no evidence to substantiate its value. It's does not seem to be of any value in the "real world". It also stains the nail and surrounding skin. At this time there are only two Health Canada approved topical medications for onychomycosis. Penlac was the first topical approved, has very low efficacy. The newer topical, Jublia is recommended for 3 or less infected nails providing there is less than 60% involvement of any one fungal infected nail. Its overall efficacy is less than half that of oral Lamisil. Laser treatment for fungal nail infections is both safe and has a successful outcome. It's far more effective than Penlac but less than Jublia. One must also be aware that there are many different types of lasers, each class developed and geared towards a specific application. For fungal nails a YAG laser at a wavelength of 1064 nm, seems to be ideal. The patient should ensure the equipment is Health Canada Approved for treatment of fungal nails.